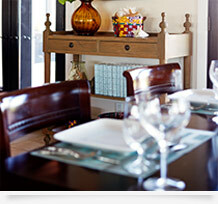 Fowl Cay offers the best of both worlds when it comes to dining. Every day can be a different combination that suits you best. Prepare a late breakfast on your villa patio, take one of our picnic lunches to a secluded beach or feast on a four-course dinner at the Hill House restaurant. Whatever way you choose, dining will be easy and delicious! Boaters and visitors to the surrounding islands are welcome to book dinner with us (upon reservation only) for hors d'oeuvres and cocktails from 6:30 p.m., dinner seating 7:30 p.m. - 9 p.m. Please contact us at 242-557-3179 or VHF Channel 16 for dinner reservations. Each villa has a fully equipped large kitchen, stocked refrigerator and pantry for you to prepare your breakfast in the comfort of your own private villa - we will ensure fresh pastries and fruit plates are delivered daily to your villa between 8:00 a.m. and 8:30 a.m. For lunch, either make your own or have our chef pack you a gourmet picnic to take on your boat to a deserted island. SPECIFIC BRAND OR PRODUCT REQUESTS THAT ARE NOT LISTED ABOVE ARE NOT INCLUSIVE IN THE VILLA PRICE AND ARE SUBJECT TO PRICE AND AVAILABILITY. Serving local seafood dishes and chef's specials, Hill House restaurant and pub is a relaxing lunch and evening dining spot. It has the highest elevation on the island and boasts 360° views of the central Exumas and spectacular nightly sunsets. With cozy, rustic décor, decorative fireplaces and outdoor seating, it's the perfect gathering place for evening cocktails and hors d'oeuvres, a late game of pool and the freshest local seafood and cuisine for miles around. We have very little that runs on a schedule, but our lunch is served between 12:30 p.m. - 2:00 p.m., and dinner seating is between 7:15 p.m. - 7:30 p.m. at the Hill House Restaurant. You are welcome to join us for hors d'oeuvres and cocktails at 6:30 p.m. which is the loveliest time of the evening for the most spectacular views from the Hill House. Served at The Hill House Restaurant, seven (7) nights a week. The Hill House (only restaurant on the island) is open 24 hours to on-island guests, so please free to help yourself to drinks behind the bar at your leisure. 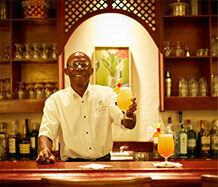 A bartender is on duty each night from 6:30 p.m. - 10:00 p.m. Dress code is smart casual, including collared shirts for men.